O UR cover this month shows the Southern Railway “Bournemouth Limited”, the most recent introduction among famous British trains. This train made its first run on 8th July last; and now leaves Bournemouth daily at 8.40 a.m, returning from Waterloo at 4.30 in the afternoon. 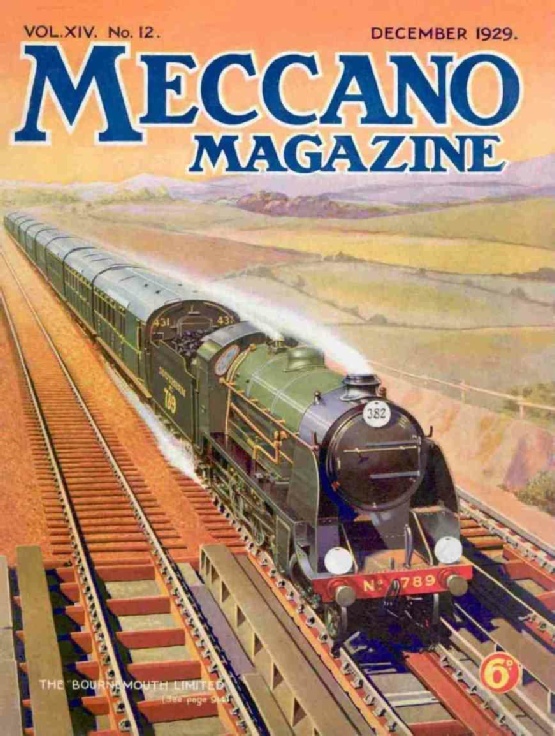 Usually, it is drawn by a locomotive of the “King Arthur” class - the one shown on our cover is No. 789. “Sir Guy” - and the journey of 108 miles is made in two hours. Travelling between London and Bournemouth in two hours is by no means a new experience, for as early as 1911 certain trains on the Bournemouth service of the then London and South Western Railway were accelerated to make the run in that time. Three trains, two “up” and one “down”, ran to a two-hour schedule, and to another “down” train only six minutes more were allowed in order to enable a stop to be made at Christchurch. In common with most English express services those of the LS.W.R. suffered severely during the War. The two-hour schedule for the Bournemouth expresses disappeared and was not restored when hostilities came to an end and conditions became normal. A great improvement was brought about in the summer of 1919 however, when the principle of arranging the departure of long distance main line trains at even times was introduced on the L.S.W.R. Naturally, the Bournemouth trains were included in the scheme and at the same time the service as a whole was materially improved, although the actual running times remained unaltered. The principle was adopted by the Southern Railway, into which the L.S.W.R. was merged, and to-day the Bournemouth service probably is the most complete of those operated in this manner. Passengers make the journey comfortably in luxuriously appointed corridor coaches, and every train is equipped with a restaurant car. In the early part of this year the only step that remained to be carried out in order to make the service completely modern was the re-introduction of the pre-war timing, and this came on 8th July of this year. Every day during the summer four expresses now make the run in two hours, and on certain days this number is exceeded. The four that regularly maintain the improved timing are the 10.30 a.m. and 4.30 p.m. “down” and the 8.40 a.m. and 5.15 p.m. “up”. It is the 4.30 p.m. “down” that has become officially known as the “Bournemouth Limited”. The corresponding “up” train is the 8.40 a.m. and is also included in the official title. These two trains maintain the two-hour schedule throughout the year. Those who wish to travel on this now famous express must book their seats if they do not wish to be disappointed, for as the name denotes, the accommodation is limited. This keeps the weight of the rolling stock down to the reasonable figure of a little more than 330 tons, and thus helps greatly in the maintenance of punctuality under all reasonable conditions. When standing in Waterloo Station the destination boards of the train quickly attract attention, for the first four vehicles are plainly marked “Bournemouth Limited”. These are a corridor brake third, corridor third and first-class coaches, and a second corridor brake third, all of which are destined for Bournemouth West. The entire train is composed of ten vehicles, the coaches for Bournemouth West being followed by a corridor brake third, a corridor composite, a dining car, and a corridor third for Weymouth, and by a corridor brake composite and a corridor brake third for Swanage. The various portions of the train are clearly marked, the destination boards of the coaches for Weymouth being lettered for Waterloo, Bournemouth Central, Dorchester and Weymouth. Those of the Swanage portion indicate equally plainly that these two coaches serve Wareham and Swanage. At the head of the train one of the “King Arthur” class usually may be found, but at times a “Lord Nelson” may have charge of the train. The locomotives that were in use in the pre-war period when the two-hour schedule was in force were not always capable of keeping time, especially if they had to haul a somewhat heavier load than usual. No difficulties of this kind are met with to-day, however, for both “King Arthurs” and “Lord Nelsons” appear to be capable of hauling any reasonable weight and maintaining booked time without showing signs of being forced. 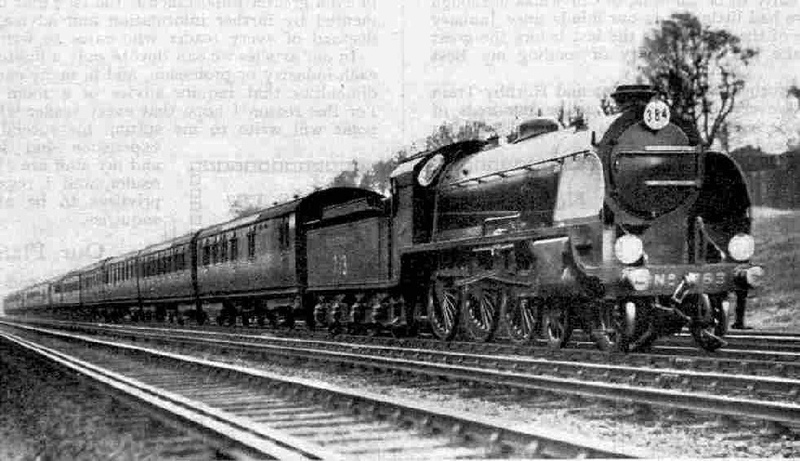 An instance of the ability of modern locomotives of the Southern Railway to cope with their task was given on a trial trip run on July 4th, four days before the “Bournemouth Limited” commenced its career. On that occasion the load was 13 coaches, and the locomotive in charge was No. E860 “Lord Hawke”, one of the “Lord Nelson” class. In spite of several checks and service slacks the train ran into Bournemouth Central 1¼ min. early. Between Hinton Admiral and Christchurch a speed of 85 m.p.h. was reached, but even at that pace the train travelled with remarkable smoothness. Down “Bournemouth Express” hauled by “King Arthur” class locomotive No. E.783 “Sir Gillemere”. In making a trip on the “Bournemouth Limited” we will imagine ourselves to have spent a pleasant holiday at Bournemouth and to be returning to London. On arrival in Bournemouth West Station we find waiting for us the steel panelled rolling stock of the latest type of which the train is composed, the green finish of the vehicles giving them a very pleasing appearance. If we follow the example of a large proportion of passengers and walk up the platform a few minutes before our departure, we may find at the head of our train a “Lord Nelson”. More probably our locomotive will be a “King Arthur” however, and it is almost certain that it will he fitted with the now familiar sheet steel “wings” at each side of the smoke-box. The purpose of these is to create a strong upward draught of air that will deflect the exhaust steam well clear of the cab windows. This is particularly desirable when working on short cut-offs, for then the exhaust steam is not flung out of the chimney with great violence and tends to hang about the boiler and cab front. For the 28.7 miles from Bournemouth to Southampton West we are allowed 34½ min., with service slacks at Christchurch and Redbridge. This stretch of road is not difficult, and over it the powerful locomotive hauls the train with no apparent exertion. At Redbridge we pass the chief permanent way depot of the Southern Railway, and shortly afterward we reach Southampton. After catching a fleeting glimpse of the great docks we run through Southampton West and on to Northam Junction, where the original line from the terminal station at Southampton joins our route. Here the curve is extremely severe and speed is reduced to little more than 20 m.p.h. Another 4.6 miles, for which we have an allowance of 6½ min., brings us to Eastleigh, the home of the locomotive works at which the earliest of the “King Arthurs” were built. Possibly our locomotive is one of these, but it may be one of the later series built in 1926 in Scotland. We are now climbing the long slope, 16½ miles in length, that ends only at Litchfield Tunnel. The average gradient is 1 in 250, but even the quite respectable load of the “Bournemouth Limited” does not appear to trouble our locomotive during the ascent, for we top the rise at a little less than 50 m.p.h., and there is very little of the snorting and puffing traditionally associated with “collar work” of this nature. The design of the engine is partly responsible for the absence of noise, for even when the “King Arthurs” are running at high speed the sound most easily detected is the ticking of the crosshead vacuum pump. at Micheldever, which is between two tunnels. As we pass through it we catch glimpses of quarrymen at work breaking away chalk and throwing it down the slopes to the wagons that will take it away from this remarkable quarry. From Litchfield we run through Wootton to Worting Junction, where we run on to the metals of the West of England main line. We are now gathering speed and through Basingstoke we travel at 65 m.p.h., the gradient of 1 in 249 being in our favour. Along the 8-mile stretch from Basingstoke to Winchfield we continue to accelerate and at Fleet, which is at the end of a 3-mile down gradient of 1 in 337, our speed is in the neighbourhood of 71 m.p.h. The road continues to be favourable for fast running, for up to a point within a mile of Weybridge it is either level or on a slight down gradient. On this stretch we register the highest speed of the run, and through Byfleet we race at more than 75 m.p.h.. and even may touch 80 m.p.h., a rate of progress that makes us think our locomotive is trying to emulate a racing car on the track at Brooklands, which is visible on our right. While flying along in this manner between Basingstoke and Woking we remember that along this splendid length of track signalling is entirely automatic. Except at stations and certain points where for special reasons signal-boxes yet remain, the signals are electro-pneumatic and are worked by the trains themselves. An installation of this kind is of the greatest value on this extremely busy portion of the track, over which a frequent service of tightly-timed expresses is run during the greater part of the day. No. E.453 “King Arthur”, the first of the class of 2-cylinder 4-6-0 locomotives designed by Mr. R. E. L. Maunsell. The earliest members of this class appeared in 1925, and as shown above were fitted with tenders of the “Drummond” pattern. Clapham Junction it becomes necessary to reduce speed. This point is little more than 104 miles from Bournemouth West, but we are due to pass it at 10.33, 113min. after starting. Through the maze of tracks of Clapham Junction we thread our way, and immediately after leaving the station itself we dive under the main line from Brighton, This joined us on our right immediately before reaching the station, and now climbs up to cross over on its way to Victoria. At this point there is an amazing area of tracks, and in all probability a greater number of parallel running lines, as distinct from sidings, exist here than anywhere else in Great Britain. High speed over the busy stretch into Waterloo is impossible, and the immense volume of traffic makes very tight timing necessary. In order to fit in the expresses between the numerous electric trains entering the terminus it is necessary to use half-minute timings. For instance, at Vauxhall the booked passing time for the up “Bournemouth Limited” is 116½ minutes after leaving our starting point. When we reach Waterloo we have travelled 108 miles, and the manner in which our splendidly appointed train has made the journey over a road that is by no means easy, is highly creditable, even to our powerful locomotive and its capable crew. “Sir Lamiel” on the “down” “Bournemouth Limited” passing Durnsford Road Power Station. The locomotive is fitted with smoke-box deflectors in order to carry the exhaust steam clear of the cab windows. You can read more about “The Atlantic Coast Express”, “The Golden Arrow” and “The Thirties, Southern Railway” on this website.